After coming home to make dinner… I was kind of tired and wanted something quick. Well I didn’t realize how fast I could actually make dinner (under 7 minutes). It was a tomato bisque with a kick! You can make it without the serrano pepper too and it is great regardless. I topped the soup with a delicious garlic infused cashew sour cream, and YEAH!!! I actually made the sour cream first and put it in the freezer while I made the bisque. 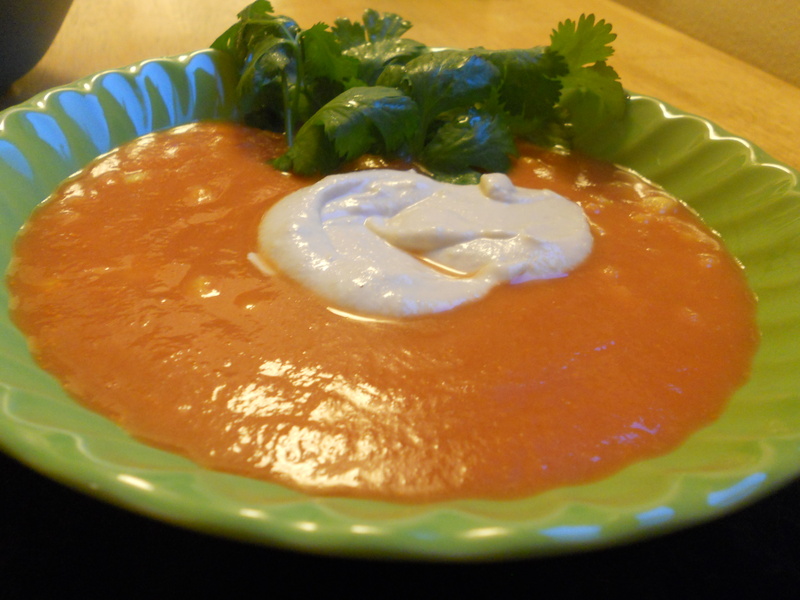 Then I didn’t even clean out the blender very well so I still had enough cashew cream to make the bisque nice and creamy. Add some cilantro on top because it is good for detoxifying and tastes great too! Blend these up in a blender and then heat on stove until desired temperature. You can even add some fresh or frozen corn to give it more texture and a slightly sweeter flavor. I added corn because the serrano was a little too spicy for me.